This book is deja vu times two (or three). It took some doing, but here is how I understand the history of this book. 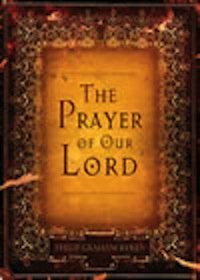 In 2000, Crossway published When You Pray: Making the Lord’s Prayer Your Own and then, in 2002 they published a hardcover abridgment of this book and titled it The Prayer of Our Lord. Both books subsequently fell out of print. Last year P&R Publishing Company republished When You Pray and now, in 2007, Crossway has reissued The Prayer of Our Lord, though this time in softcover. So this means the book has been published two times in each of two formats. Are you still with me? The book begins with a chapter dealing with how we are to pray (shortened from three chapters in the original). Ten chapters follow, each of which discusses one of the phrases or petitions of the Prayer, beginning of course with “Our Father in Heaven and closing with “The Power and the Glory.” Ryken shows how this prayer can be prayed as-is, but also how it ought to model our other prayers. It is easy to read and simple to digest and with short chapters of only six or seven pages it is well suited for use with personal devotions or quick reading. Unlike the original, it does not have an index or Scripture index at the end. If you already own one of this book’s several predecessors there is no compelling reason to purchase this one. In fact, if you are looking for a book on prayer there are better options available, including the full version which I’ve reviewed here and which can be had for only a few dollars more. Still, I would recommend this one for those who read only occasionally and can see it making a good gift for friends or family. The teaching is sound and the book is not without value.